It is a mistake to suppose that Sitting Bull, or any other Indian warrior, was of a murderous disposition. ... The common impression that the Indian is naturally cruel and revengeful is entirely opposed to his philosophy and training. Sitting Bull ... accepted in good faith the treaty of 1868 ... hoped [for] close adherence to the terms of this treaty to preserve the Big Horn and Black Hills country. ... When ... the irrepressible gold seekers made their historic dash across the plains into this forbidden paradise, then his faith in the white man's honor was gone forever. 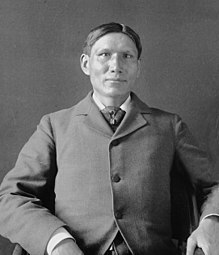 Charles Alexander Eastman (born Hakadah and later named Ohíyesa; February 19, 1858 – January 8, 1939) was a Santee Dakota physician educated at Dartmouth and Boston University, a writer, national lecturer, and expert on Sioux and American Indian History. Love between a man and a woman is founded on the mating instinct and is not free from desire and self-seeking. But to have a friend and to be true under any and all trials is the mark of a man. Nearness to nature ... keeps the spirit sensitive to impressions not commonly felt and in touch with the unseen powers. The American Indian was an individualist in religion as in war. He had neither a national army nor an organized church. There were no temples or shrines among us save those of nature. He sees no need for setting apart one day in seven as a holy day, since to him all days are God's. The true Indian sets no price upon either his property or his labor. His generosity is limited only by his strength and ability. Each soul must meet the morning sun, the new sweet earth, and the Great Silence alone! What is Silence? It is the Great Mystery! The Holy Silence is His voice! The Wise Man believes profoundly in silence - the sign of a perfect equilibrium. Silence is the absolute poise or balance of body, mind and spirit. The man who preserves his selfhood ever calm and unshaken by the storms of existence - not a leaf, as it were, astir on the tree, not a ripple upon the surface of the shinning pool - his, in the mind of the unlettered sage, is the ideal attitude and conduct of life. Silence is the cornerstone of character. The surveyors of the Union Pacific were laying out the proposed road through the heart of the southern buffalo country [~1862] ... some of the smaller and weaker tribes were inclined to welcome the new order of things, recognizing that it was the policy of the government to put an end to tribal warfare. The famous treaty of 1868.... Red Cloud was the last to sign, having refused to do so until all of the forts within their territory should be vacated. 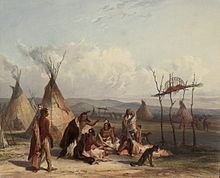 All of his demands were acceded to, the new road abandoned, the garrisons withdrawn, and in the new treaty it was distinctly stated that the Black Hills and the Big Horn were Indian country, set apart for their perpetual occupancy, and that no white man should enter that region without the consent of the Sioux. It is not easy to characterize Sitting Bull, of all Sioux chiefs most generally known to the American people. ... The man was an enigma at best. He was not impulsive, nor was he phlegmatic. He was most serious when he seemed to be jocose. He was gifted with the power of sarcasm, and few have used it more artfully than he. It was said of him in a joking way that his legs were bowed like the ribs of the ponies that he rode constantly from childhood. ... It is told that after a buffalo hunt the boys were enjoying a mimic hunt with the calves that had been left behind. A large calf turned viciously on Sitting Bull, whose pony had thrown him, but the alert youth got hold of both ears and struggled until the calf was pushed back into a buffalo wallow in a sitting posture. The boys shouted: "He has subdued the buffalo calf! He made it sit down!" And from this incident was derived his familiar name of Sitting Bull. It is a mistake to suppose that Sitting Bull, or any other Indian warrior, was of a murderous disposition. It is true that savage warfare had grown more and more harsh and cruel since the coming of white traders among them, bringing guns, knives, and whisky. ... It was the degree of risk which brought honor, rather than the number slain, and a brave must mourn thirty days, with blackened face and loosened hair, for the enemy whose life he had taken. While the spoils of war were allowed, this did not extend to territorial aggrandizement, nor was there any wish to overthrow another nation and enslave its people. It was a point of honor in the old days to treat a captive with kindness. The common impression that the Indian is naturally cruel and revengeful is entirely opposed to his philosophy and training. As he talked he seemed to take hold of his hearers more and more. He was bull-headed; quick to grasp a situation, and not readily induced to change his mind. He was not suspicious until he was forced to be so. All his meaner traits were inevitably developed by the events of his later career. When Sitting Bull was a boy, there was no thought of trouble with the whites. He was acquainted with many of the early traders...and liked them, as did most of his people in those days. All the early records show this friendly attitude of the Sioux, and the great fur companies for a century and a half depended upon them for the bulk of their trade. It was not until the middle of the last century. They [Sitting Bull's people] would not have anything of the white man except his hatchet, gun, and knife. They utterly refused to cede their lands; and as for the rest, they were willing to let him alone as long as he did not interfere with their life and customs, which was not long. Sitting Bull joined in the attack on Fort Phil Kearny and in the subsequent hostilities; but he accepted in good faith the treaty of 1868, and soon after it was signed he visited Washington. ... [He] hoped [for] close adherence to the terms of this treaty to preserve the Big Horn and Black Hills country for a permanent hunting ground. When gold was discovered and the irrepressible gold seekers made their historic dash across the plains into this forbidden paradise, then his faith in the white man's honor was gone forever. 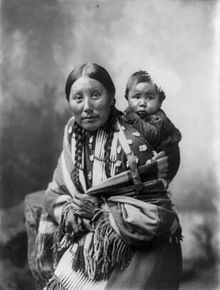 Many of the Indians believed that one may be born more than once, and there were some who claimed to have full knowledge of a former incarnation. The first bambeday, or religious retreat, marked an epoch in the life of the youth... Having first prepared himself by means of the purifying vapor-bath, and cast off as far as possible all human or fleshly influences, the young man sought out the noblest height, the most commanding summit in all the surrounding region. Knowing that God sets no value upon material things, he took with him no offerings or sacrifices other than symbolic objects, such as paints and tobacco. Wishing to appear before Him in all humility, he wore no clothing save his moccasins and breech-clout. At the solemn hour of sunrise or sunset he took up his position, overlooking the glories of earth and facing the “Great Mystery,” and there he remained, naked, erect, silent, and motionless, exposed to the elements and forces of His arming, for a night and a day to two days and nights, but rarely longer. *Sometimes he would chant a hymn without words, or offer the ceremonial “filled pipe.” In this holy trance or ecstasy the Indian mystic found his highest happiness and the motive power of his existence. To keep the young men and young women strictly to their honor, there were observed among us, within my own recollection, certain annual ceremonies of a semi-religious nature. One of the most impressive of these was the sacred “Feast of Virgins,” which, when given for the first time, was equivalent to the public announcement of a young girl’s arrival at a marriageable age. The herald ... “Pretty Weasel-woman, the daughter of Brave Bear, will kindle her first maidens’ fire to-morrow! All ye who have never yielded to the pleading of man, who have not destroyed your innocence, you alone are invited, to proclaim anew before the Sun and the Earth, before your companions and in the sight of the Great Mystery, the chastity and purity of your maidenhood. Come ye, all who have not known man!” ... Any man among the spectators might approach and challenge any young woman whom he knew to be unworthy; but if the accuser failed to prove his charge, the warriors were accustomed to punish him severely. Each girl in turn approached the sacred rock and laid her hand upon it with all solemnity. This was her religious declaration of her virginity, her vow to remain pure until her marriage. If she should ever violate the maidens’ oath... Our maidens were ambitious to attend a number of these feasts before marriage, and it sometimes happened that a girl was compelled to give one, on account of gossip about her conduct. Then it was in the nature of a challenge to the scandal-mongers to prove their words! A similar feast was sometimes made by the young men, for whom the rules were even more strict, since no young man might attend this feast who had so much as spoken of love to a maiden. In them [our women] was vested our standard of morals and the purity of our blood. The wife did not take the name of her husband nor enter his clan, and the children belonged to the clan of the mother. All of the family property was held by her, descent was traced in the maternal line, and the honor of the house was in her hands. Modesty was her chief adornment; hence the younger women were usually silent and retiring. Certainly the Indian never doubted the immortal nature of the spirit or soul of man, but neither did he care to speculate upon its probable state or condition in a future life. Charles Alexander Eastman (1859-1939), Sophia Smith Collection, Smith College. This page was last edited on 9 December 2018, at 21:32.